There was still the smell of fresh paint when I walked into Glasserie last week. The room was quiet and beautiful, especially the natural light that fell onto my table as I sat there waiting for Howard. I didn’t go to Glasserie to try a new restaurant instead I was there to support and cheer on a friend. I met Sara Kramer at Allswell and quickly found out we have few mutual friends. And here she was, 2 years later, running her own kitchen. I knew our meal was going to be good but I wasn’t expecting Sara to blow our freakin minds away. We started off with a dish of lightly grilled radishes, warm and crunchy, served with feta, mint leaves and a sprinkle of za’atar. Both of us took a bite and both of our eyes widened with delight at the same time. I have never had radishes this good before. For my main course, I got the flatiron steak, cooked perfectly to medium rare. But trout roe and steak together? Yes, it works. Probably the most satisfying thing I have eaten so far this year were the three pieces of flaky bread. They were so good, I got a 2nd order. 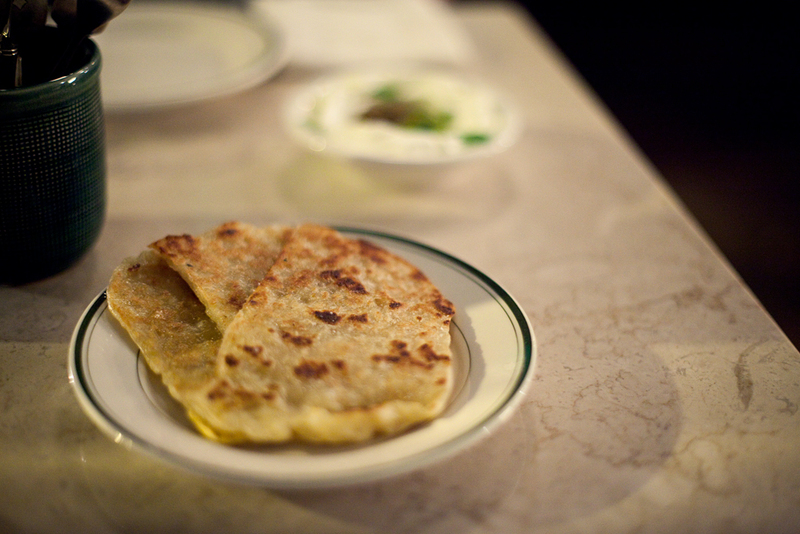 Warm and buttery, they were a perfect match for the cool and slightly tangy labneh. And for dessert, a delicious chocolate tart and a cup of strawberries with yogurt. Strawberries and yogurt may sound simple but Sara was able to make it something more. Congrats again to Sara and the team at Glasserie. I am excited to see what else they’ll do/cook and I’ll definitely be back for more meals. Check out what Howard thought over on his blog.